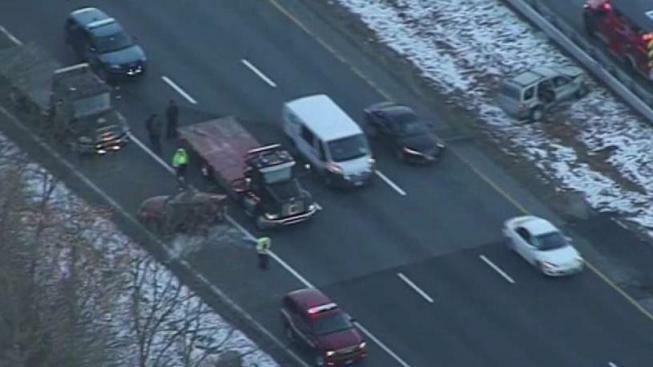 A 4-year-old boy and his mother were among four people injured in a serious crash that shut down Interstate 93 Friday afternoon in Andover, Massachusetts. Multiple emergency crews responded to I-93 Northbound just prior to River Road at 3:02 p.m. for reports of a two-vehicle crash. A preliminary investigation reveals that a 2007 Chevrolet HHR was broken down in the break down lane of the highway prior to exit 45, when it was struck from behind at a high rate of speed by a Ford Escape, causing the broken down vehicle to be sent across the highway, ending up in the left lane. The break down lane in that area is open to traffic at 3 p.m.
A 28-year-old woman from Nashua, New Hampshire, was the driver of the broken down car. Her 4-year-old son was in the back seat in a car seat. Both were taken to Lawrence General Hospital before the 4-year-old boy was later taken by medical helicopter to Boston Children's Hospital with serious injuries. The Ford Escape was driven by a 22-year-old from Bow, New Hampshire. Both he and his passenger were taken to Lawrence General Hospital, as well. The driver was later taken by ambulance to Beth Israel Deaconess Medical Center in Boston. There have been no updates on the victims' conditions, and no names have been released. The crash shut down all northbound lanes and one southbound lane, backing up traffic for several miles. Massachusetts State Police are investigating the crash.